In this post which is part 4 of my mini-series Learning Razor with an RSS-App we'll enable DNN-Search support for the new Lucene-based search built into DNN in Version 7.2. The search topic is very complex and I'll write more about it some other day - so let's just focus on some minimal parts for now. Also install the V4-App for this lesson from Codeplex or the forge. If you need help, just watch the video of post #2 in this series. How does the DNN-Search work? There are basically two ways to create a web-search. The other is a more data-oriented approach, where the indexer looks at the data (directly in the DB or through the object-model) and says "give me everything and tell me how to use it". This is harder to implement, more error prone (these are the drawbacks) but more precise and controllable. It also allows us to index things that "don't exist" or add metadata which is never displayed but important for search. DNN actually has both of these systems built in, but only in the pro version Evoq Content. The DNN-Platform only has a data-oriented, non-spider search. So if we want to create something useful, we must support that search interface. To support search, you don't support an interface, you must inherit a class ModuleSearchBase. This is bad, but it's the way it is. IMHO it should be a ISearchable or something (similar to the previous version). I don't know why they went from an interface-design to a class design. So: I believe these interfaces will change again in a near future - for now, they work. In a perfect MVC-situation, there must be a controller that delivers data for the search, while the view should have no role in this at all. So in reality, when you create a module in DNN, you will have to support these search commands. If you want to give the end-designer (the web-designer or view programmer) the power to modify this, you must do something in addition to the View engine. 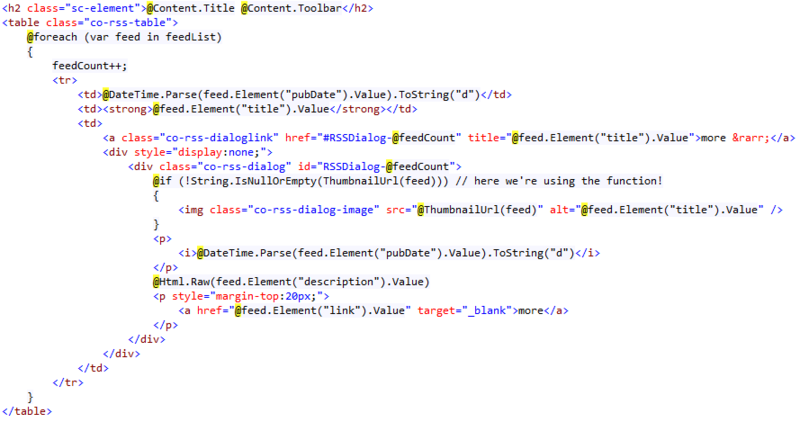 The Razor-view might need to add data which is not accessible in 2sxc - like this RSS-feed. But there are also other possibilities, like SQL-queries or even 2sxc-data with special filters applied. Because of this, there is a CustomizeData method that is always called if it exists in the template. …and it also called when the Search-Crawler indexes the module. So in this method you have the ability to add data to the Data-Object - which would then end up in the search index. 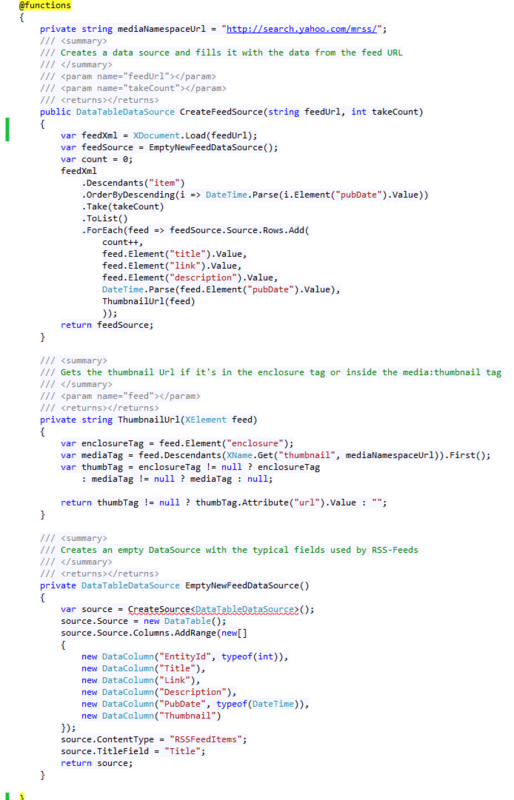 Note: the code got a bit long (about 60 lines of code) - so we outsourced it. Note that there is more to it - like there are status variables so that your code knows you're in index-mode, and there is another command CustomizeSearch for advanced search customization like alternate URLs (see documentation). But for now, let's keep it simple. This is how our Views can customize the search. Note that there are other ways - but if your module ever supports custom Razor-Views, you might want to plan with something like this as well. and then using the data table as a DataSource. This has to do with the Data-Pipeline concept of 2sxc, allowing you to chain data-functionality. So once something is in a DataSource, it can benefit from other data-sources (like URL-Filters, advanced caching, etc.). Internal code: Then it attaches this new data-source to the main Data, and that's it! ...here. But it's even better to just download the App and work with it. Go ahead and mess about with the code. 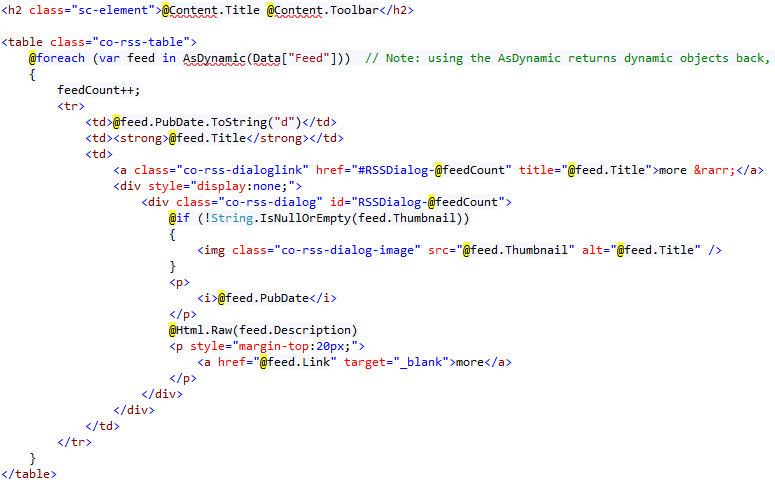 You can do it in Visual Studio or with the edit-template functionality. And don't worry: you can always uninstall the App and install it again when you mess it up :).